Print forms and reports faster with the DFX-9000 MONO DOT MATRIX PRINTER. Get a trusted ally in inventories in the DFX-9000 MONO DOT MATRIX PRINTER. This dot matrix printer is going to be an indispensable tool in inventories, what with its 1550cps print speed and a mean time between failures of 20,000 hours. This monochrome 9-pin dot matrix printer will make short work of any inventory documents with its ability to print as much as 1150 characters per second. And it can be connected to any existing workstation in the inventory floor, with its serial, parallel and USB connectivity. Continuous form/label compatible; speed up inventory reports by using the continuous form printing capability of this printer. With speeds up to 1550 cps and an MTBF rating of 20, 000 power-on hours (POH), the Epson DFX-9000 offers the power and durability to tackle the most demanding print tasks. Day after day, you can count on it to efficiently process everything from reports and 10-part forms to shipping documents or mailing labels. A robust, dependable workhorse, this 9-pin, wide-format printer boasts a 400-million-character print head life and 15-million-character ribbon cartridge, which minimizes production costs and reduces the need for frequent user intervention. Its advanced paper handling capabilities make it the perfect solution for a wide variety of applications, including critical spreadsheets, checks, invoices, bar codes and more. 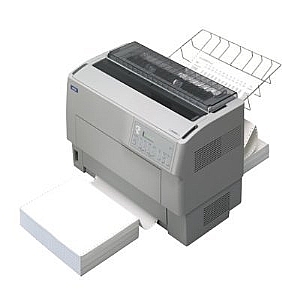 Featuring two standard paper paths, the DFX-9000 easily switches between multiple applications. Its intelligent paper sensor detects the paper width and thickness, adjusting automatically for optimum performance and high-quality results. It even features an automatic jam sensor to prevent wasting forms in the unlikely event of a paper jam. With Parallel, Serial, and USB interfaces standard, plus a type-B slot for optional connectivity, the DFX-9000 easily attaches to new or legacy systems in standalone or networked environments. And, its convenient LCD display and intuitive menu selections mean setup has never been easier.